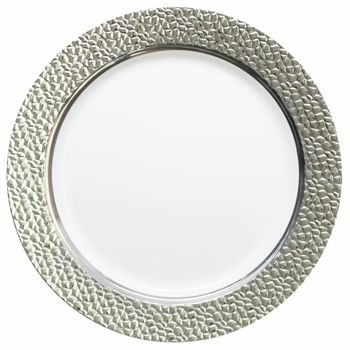 Hammered Collection 10 1/4" White w/ Silver Hammered Border Banquet Plastic Plates 10ct. Hammered Collection 9" White w/ Silver Hammered Border Luncheon Plastic Plates 10ct. Hammered Collection 7" White w/ Silver Hammered Border Salad / Cake Plastic Plates 10ct. Hammered Collection 12oz. White w/ Silver Hammered Border Plastic Bowls 10ct.